Have faith in God, and stand strong because there's a wave of atmospheric disruptions that will be shaking up the wicked. 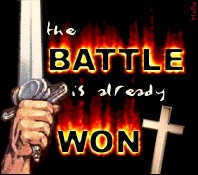 We're in a battle that's not ours but the Lord our God is mighty within our midst and He shall fight for us. He is our strong tower and fortress where we can run to for safety. The Lord's hand of justice shall prevail on those who would cause havoc in the lives of His people because the Lord is angry with the wicked every day! So gird up your loins with truth and speak the Word of God with boldness against your adversaries. Remember, "No weapon that is formed against us shall prosper and every tongue that rise against us in judgment we shall condemn for this is the heritage of the servants of the Lord; and our righteousness is of the Lord, says the Lord." There is a war going on in the heavens; and also wars and rumors of wars in the earth. But the peace of God shall be with His people even in the midst of the world’s turmoil. Get ready now because there's a shift in the Spirit realm and God is about to show Himself mighty in the midst of His people. Set yourselves, and stand you still to see the salvation of your God who is with you. Know that we are more than conquerors in Him who has loved us unconditionally even from the foundation of the world. Continue on to do the will of the Lord; and work while it is day and occupy until the Lord comes with great power and glory. As the Lord have said, Lo' I am with you always even unto the end of the age. Worship and praise the Lord with singleness of heart and rejoice! Be strong in Him and in the power of His might! You shall overcome in all things; so prosper and be in health, even as your soul prospers in the Name of Yeshua, Ha'Machiach (Jesus the Messiah, the Anointed One of God)! Amen and let it be so...Selah.